While nearly every dehydrator on the market advises you to line its trays with microwavable plastic wrap, some dehydrator users have concerns that it can leach potentially harmful chemicals into your food, affecting its taste and safety. Other products make effective liners for your dehydrator trays, but each type has its drawbacks. Determine why you need to line your trays before you decide which product will best meet your food dehydrating needs. Dehydrated food requires less space to store. Lining dehydrator trays prevents liquid from foods on your upper trays from leaking into lower trays. It is easier to peel sticky foods such as fruit or vegetable leathers from lined trays. Lining your dehydrator trays also prevents any fats or oils rendered from meats or cheeses from congealing in the bottom of the dehydrator. Fats and oils are quick to go rancid and affect the flavor of your dried foods, according to Patricia Kendall, professor of Food Science and Human Nutrition and John Sofos, professor of Animal Sciences at Colorado State University Extension. Juicy, sugary foods such as fruits can drip through the mesh of some dehydrator trays and caramelize. This causes the purees used to make fruit leathers to stick. 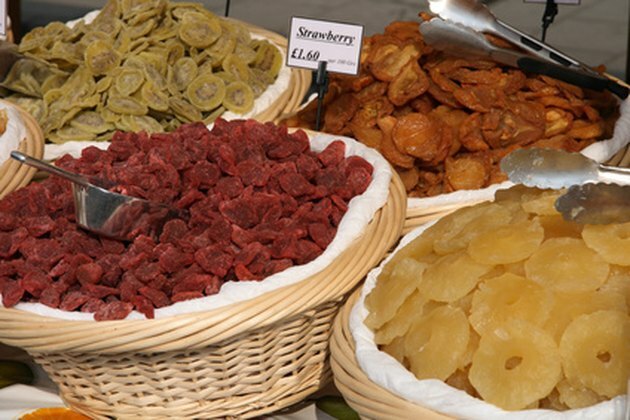 Plastic wrap's flexibility makes it easy to remove fruit leather sheets from dehydrator trays without tearing them. Plastic wrap contains the juices, preserving flavor and preventing a sticky mess from forming in the bottom of the dehydrator. But parchment paper will hold liquid almost as long, without the risk of chemical leaching. Parchment paper scorches between 375 and 450 degrees F, and will burn at temperatures approaching 550 degrees F, according to artisan bread baker Barry Harmon. Dehydrating temperatures range from 120 degrees F when you first begin drying fruits to between 140 and 160 degrees F when dehydrating meats. This makes parchment paper a safe, effective choice for lining your trays. Although some dehydration recipe sites advise using unusual lining materials such as nori sheets, made from dried seaweed, this is a matter of taste. Nori's strong, grassy, fish flavor can penetrate into your food. If you are making dehydrated clam chowder, this might be a beneficial effect. It may not be as pleasant a flavor when paired with venison or other wild game. You can avoid taste transfer altogether if you give your trays a light coating of cooking spray instead, advise University of Kentucky Extension specialists Kathy Daly-Koziel and Fudeko Maruyama. While this will not work for pureed foods, it is perfect for meats and sliced vegetables. Liquid products such as tomato paste or hummus require special tray inserts if you do not want to line your trays. Waxed paper will stay intact long enough for drippy foods to dehydrate, as long as you spread your liquid foods 1/4-inch thick or less. The thinner you can spread saucy foods, the faster they will dry. Your food may acquire a waxy taste, which some people find unpleasant. What Is Freezer Paper Vs. Waxed Paper?